Mike Tyson once said “everyone has a plan – until they get punched in the face.” I spent a considerable amount of time in 2014 dusting myself off from the barrage of punches life threw at me in 2013. What I learned in 2014 is a big reason I haven’t been able to accomplish a majority of my resolutions over the years is a lack of time. Year after year I have the best of intentions to keep my resolutions, but life hits me with punches. Sometimes life’s punches are jabs you come to expect, and can often block. Sometimes you don’t see life’s punches in the form of an uppercut that throws your head back and makes you wonder what hit you. Every now and then the worst of the punches come called haymakers. Haymakers are instances when life winds up and really gives it to you good. No matter how strong, resilient, or well trained you are, no human can escape from getting knocked down after being hit by a perfectly placed haymaker. Because nobody likes getting punched in any way, in 2015 my strategy is to be incredibly strategic. I want to move with intention, but remember to listen to advice from my corner on how to best proceed into the next round. Something I absolutely learned in 2014 was in the sport of boxing it is you alone in the ring against your adversary and I don’t want to be in that type of ring. There were many times in 2014 I felt alone in the ring and there were some tough adversaries. In business and life, teaming up with others is what has almost always made me most happy and successful. In 2015 I am looking to team up with many others to help fulfill their dreams, but remembering I’ll need their help to achieve my own as well. I wrote about it briefly last year but think it is important to touch on it again now. On December 10, 2013 I was laid off which resulted in an unprecedented 4 months of uncertainty. The first thing I missed was the great many people I worked with. The other thing I experienced for the first time was phantom vibration syndrome which resulted in me often reaching for a work issued BlackBerry that was no longer there. The distress caused by the unfamiliarity of not having my BlackBerry quickly passed when I realized my previous responsibilities and challenges were also no longer there. Suddenly my life was adrift, but I felt a strange sense of reassurance. Although I wasn’t familiar with the uncharted waters before me, they were fast and exciting and I welcomed each new day with great anticipation. The time I was able to spend with family is time I will never be able to get back. Time is a common theme I’m starting to realize as being incredibly important as I get older. Remember the first time you arm wrestled your father and realized how strong he was and how much less strong you were? As I have aged I have come to realize the same struggle of time’s strength on my life when attempting to hold back it’s hands. In addition to spending time with family, I strived to learn as much as I could about topics I was most interested in. I got tremendously better at PHP and CSS after picking up a web application I had been working on as my “side project” for years. I am not ready for even an alpha announcement, but much of my spare time is now spent working on it. Career wise things ended up working out nicely in the end because in April I joined AWS as the Web Content Manager in Developer Marketing at their San Francisco office. At the same time, I don’t want to paint an unrealistic picture of the first few months of 2014. I had my fair share of self doubt despite my sometimes unrelenting positive perspective on life’s challenges. I’ve mentioned it before, and I’ll say it again, you can’t ever stop believing in yourself. I don’t care who you are, at some point in life you will go through adversity and people will doubt your ability to overcome whatever obstacle stands in your way. I’ve developed a mantra over the years which is to shake it off and take a step up. Whatever mantra you adopt, just promise me one of your life’s mantra’s is to never stop believing in yourself. It will make all the difference and you won’t have to look far to see people who have given up when life’s proverbial dirt was piled on them. The goals I laid out in 2014 were to juggle 3 balls (I didn’t try at all so…fail), focus more time on stretching (fail), drinking more water (eh), flossing (eh), and reading a book a month (yeah, just about). Below are the books I read thanks to nearly two hours a day on BART. Unless you love WordPress, or have a passion for learning about innovative ways companies operate internally, this book may not be for you. I obviously love WordPress, Scott’s books, and learning the new ways innovative companies are operating, so this was a great read for me. Like Scott Berkun, I love all things Alexis Ohanian has produced and shared in his life thus far. I loved Alexis’s book and more than anything else am happy a good person succeeded in the startup world. A must read if you work for, or love Amazon. If you’ve read it, I’d love to chat about it. For some reason this book didn’t resonate with me. It could have been that I had already read a lot about operating a startup, not sure. Probably the best book I read all year. I couldn’t put this book down despite already knowing a lot about Steve Jobs. What a fantastic, well written book. If you are into reading about the startup game, this is another must read. Ben is a great writer and another all around good person. The first few chapters are a must read and are incredibly entertaining and transparent. Another great read from Alexis. There was some overlap between this book and Without Their Permission, but I will read and watch anything Alexis shares. I insisted Christina read this one. If you have ever thought about doing anything philanthropic (large or small), this book is a must read. Adam Braun has passion for philanthropy and I love anyone with passion who use it for good. Such a great read. Another book I couldn’t put down and wait to pick back up. Another Scott Berkun book, this one is unlike must of his other books in that it is incredibly personal, transparent, raw, and reflective. I did enjoy this one. I’ve talked about this one in small groups and have found Mark Cuban to be a polarizing personality. I can’t agree with everything he says or does, but man do I love his passion (see a theme yet?). A fantastic book in my opinion on business if you are someone who can look past some of the more controversial things he’s said and done. Create a resolutions app by February 20, 2015 to track progress of my resolutions so I am held accountable to my progress throughout the year. Take my old buddy Wilbur (the dog) for a walk at least once a week. Do at least one blog post a month. I’ve really fallen out of the habit. Don’t drink any diet or regular sodas. I stopped drinking regular sodas several years ago for health reasons and picked up the bad habit of “switching to diet.” I’ve been eating very well over the last year and want to continue that trend by drinking no soda whatsoever. I love writing, but my grammar hasn’t always been the best. I recently came across an article recommending The Grammar Book by Susan Thurman. As you can see on the Amazon page, it has received some great reviews and promises to be engaging. My actionable takeaway is to read the book, and apply the learning to my every day writing. Coco Chanel once said “don’t spend time beating on a wall, hoping to transform it into a door” and I can sometimes get in the habit of obsessing over ideas, people, and especially companies that either don’t want to change, or aren’t capable of changing. The actionable takeaway here is at the end of the year to write things I did to take matters into my own hands. This may often mean having the courage to walk away from things that aren’t ready to change, and venture onto the the path of happiness versus familiarity. Speaking of reading, because I had such success in 2014 I’d love to read 12 more books in 2015. You are a bundle of seemingly endless energy who loves life. Mom says you get it from me (the love of life part, I can’t match your energy levels at 37), but wow are you ever awesome. So far next to nothing slows you down and you literally can conquer anything life has thrown at you with ease. The only resolution I can think of for me and you is to see if we can focus that energy by learning to swim. Mom and I have talked about some tumbling or gymnastics classes too. Other than that I think the best thing I can do for you is keep out of your way and pick you back up when you fall. Reminds me a bit of this blog post. I thought 2014 was a really good year for us. Life threw some big punches our way but we really rallied and came together to overcome them. In 2015 I’d love to have a monthly date day/night. My little man is now seven years old and everyone knows how much I love my buddy. I was telling Christina recently that I need to focus more dedicated time on you because life and your little sister have demanded more of my time and you deserve more. 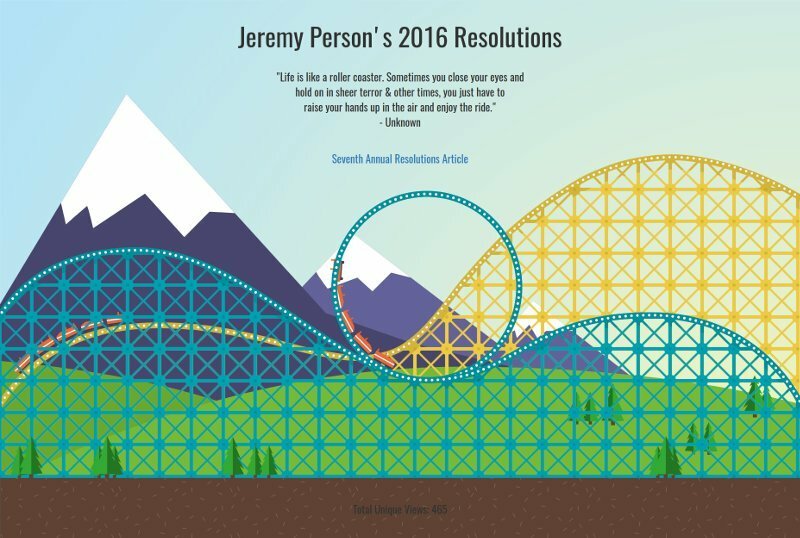 To make the resolution measurable let’s go on a bike ride once a month, play tennis once a month, video game time once a month, and practice your handwriting one a week. Something I haven’t done in past resolutions is reflect on the past year. 2013 was one of my more difficult years, I have to admit. I even checked with Christina tonight to verify I wasn’t missing anything. In 2014 I’m ready to get some big wins again. One of the first things I talked about at the start of 2013 was the number of blog posts I had shared with the world. At that time I was at 2,900 posts and as of today I am at 2,966 posts. I think I’m learning something that many of you were already aware of with blogging. I focused a lot of my energy on sharing many things I thought you would be interested in because I really enjoy sharing what I learn or discover in life. I’ll continue sharing but perhaps in another way. I’ve been working on a platform since 2008 that I have been obsessed with. A tool I use every day but know others won’t find value in as is today. With more dedicated personal time on my hands as of late I’ve tried each day to make incremental improvements to it. I say all of this to reassure you that I haven’t lost my love of blogging, or sharing, but rather hope in 2014 I can share with you what I’ve been working on and how much I’ve contributed to the platform myself. The next thing I discussed in my 2013 resolutions was I wanted to be able to do 50 consecutive push-ups. This goal hasn’t been accomplished for a number of reasons. The first is 50 consecutive push-ups is difficult and difficult resolutions are often the most challenging to accomplish. The second is with two kids and everything life demands, focusing on something you would think you could work on at almost any time and any place just never took priority. My right arm has been nagging me as of late. I never had it looked at by a professional but back in high school I think I tore one of the muscles in my arm playing baseball. If I let my arm rest for a while it doesn’t ache but carrying around a 26 pound baby at extended lengths of time has aggravated it again. It isn’t a constant pain but flares up when my arm is stressed. I also talked about taking more pictures. Interestingly that hasn’t been happening as of late and I’m not exactly sure why. I got a digital SLR camera which has broken once, I sent it back for repairs, and on a recent trip to Monterey it broke yet again. The SLR camera is great but it is cumbersome to carry around and I’ve never been happy with my point and shoot (especially once I got my SLR). I know I can’t “have my cake and eat it too” but somehow I became more disinterested in taking pictures. I brought up “rocking the ping pong” and I think I did. Safeway buying a table and letting us play on Friday afternoons in an empty conference room was fantastic on so many levels. One of the more interesting and unexpected things I found as a result of playing ping pong at work was the opportunity to meet people you wouldn’t normally bump into. Managing Safeway’s intranet you get to know a lot of people from a wide range of departments but each department usually had certain employees I interacted with. Ping pong was great because I was able to play something I’ve always loved and have a great time with new people. One of my favorite things about ping pong in 2013 was playing with members of our team and seeing their skills evolve. There was a ping pong tournament towards the end of the year and due to part luck of the draw, and part determination I even made it into the finals (but lost). At the end of the day it wasn’t so much about winning or losing for me, it was just getting a chance to have fun with colleagues. That isn’t to say I like to lose, I’m one of the most competitive people I know, but I will always remember all the great times we had. Probably my least favorite resolution was making the bed each day in 2013. I don’t think I came anywhere close on this one I have to be completely honest. If you go back to past resolutions you’ll see I seem to have this as a recurring resolution but in 2014 I’m not including it. One of the things I’m learning is life gets busy and you prioritize your time accordingly. Almost all of 2013 was incredibly busy and this will sound wrong but I just had better things to do with my time (higher priorities) than worrying about if the bed was made. Teach Tyler to ride a bike without training wheels. It took a lot of trials and tribulations but ladies and gentleman I am proud to announce he did it. As a matter of fact he’s actually outgrown the bike in the video and got a new 18″ bike for Christmas. Hard to believe he’ll be 7 years old in May. Run a 5k with an average pace of less than 10 minutes a mile. I started this goal out with a vengeance but just as I was about to run my first 5k I came down with a horrible cold. I wanted to still run the race but Christina who is my wise advisor said I would be crazy (and she was right). The number one thing I would tell someone who starts running is no matter what…DON’T STOP! The reason being it is hard to start running because the first few weeks, or for me, months were horrible. There was pain and definitely fatigue, I just hated it. Eventually I started to get stronger and run farther but just as I was making progress I ran into an obstacle and I stopped. I tried running a few times after but I let too much time elapse and before I knew it I was back to the pain and fatigue phase and stopped for good the rest of the year. This one is probably going to surprise many of you because you probably didn’t know it is something I’ve always wanted to be able to do but I want to be able to juggle with 3 balls. I saw a book at a local bookstore the other day and told Christina I’d love for Tyler to be able to juggle because everyone needs a seemingly useless talent to just master for the sake of being able to do it. Admittedly I’ve tended to do things in life that I thought would benefit me but sometimes there are things I just want to be able to do “just because”. Tyler most likely won’t learn to juggle if I can’t juggle so I’m therefore making it a resolution for the year. I know it is a resolution that I am very likely to fail at because again it is difficult and will take patience, time, and practice. The next resolution is to focus more time on stretching and becoming more flexible. This is going to sound lame but at 36 I’m just now starting to realize the aches and pains of ageing. I’ve never been flexible but I’m probably one of the least physically flexible people I know and I think that is very unhealthy because as I age I’m realizing how important it is. Drink more water. Pretty self explanatory but yeah, drink more water. My dentist has been telling me for years to floss but I’ve never taken her advice. I would like to floss at least 3-4 times a week in 2014. Read a book a month and I’ll even share my list with you. You might think “getting a new job” would be a 2014 resolution but I don’t think I’m going to add that one. I’ve been doing a lot of thinking and have come to a number of new realizations as of late. This is one of the most unique times in my life and I’m not wasting a day. I want to be the best “Person” I can be in 2014 and beyond! Here’s to a great 2014. Today I was driving to work and was at the right place at the wrong time. As soon as I merged onto 580 going west bound I saw a Range Rover make a very hard left to avoid the car in front of him which caused it to flip onto the roof of the car twice. The most difficult thing to see was I saw the man driving the vehicle get ejected from the car and thrown high up into the air and onto the highway. Something else I’ll never forget is as the car was flipping a bunch of dust and debris was in the air and all the sudden that dust turned pink. It was like I was watching a movie right before me but I obviously knew it wasn’t. Cars immediately stopped just before the location where the SUV came to a stop and we all sat there for a moment not quite sure what to think or do. It was like time stood still for a moment. I drove my car onto the shoulder of the highway so I could call 911. Fortunately 911 picked up within 20 seconds of me dialing which was great. I was in shock, I know I was because after getting off the phone I realized some of the information I gave to the operator wasn’t as accurate as it should have been. While I was talking with 911 an African American man started climbing out of the SUV’s sunroof and was very likely in shock because as soon as he made it to the roof he literally rolled off the roof and collapsed onto the highway. He got up maybe 30-45 seconds after falling to the highway and walked close to the front of my car and collapsed again at the side of the road and sat down. Everything about the crash was disturbing and I felt so helpless. I had my son in the back of the car and people were trying to get by the accident so I was also afraid of becoming an accident. A nurse came to the scene and tended to the African American man and I talked with an officer to help give a report later in the morning. If anyone has more details on the victims of the crash I’d love to know more. I pray for their families and themselves and can’t express enough how much I feel for them. 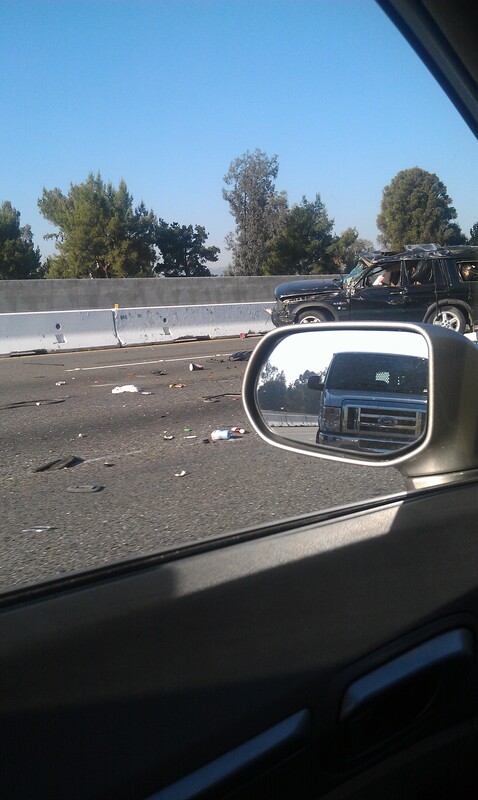 The photos of the car is from a picture a coworker found on Waze and is not something I took. It does however help show what I saw (to a degree). Please drive safe everyone and please buckle up. My dad had a four way bypass today here in Portland. After being able to talk to him after the third time seeing him today he had some advice he urgently wanted to share with me. 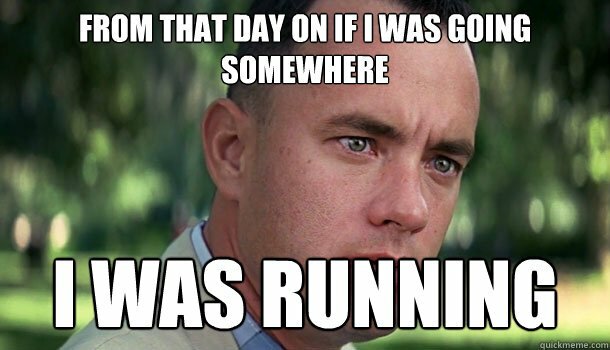 The first thing he said to me was “Jeremy, RUN!” What he was referring to was I started to train for a 5k a few months ago that I wasn’t able to participate in because I came down with the flu. Essentially he was saying “Jeremy, do whatever you can to take care of yourself because you don’t want to be where I am some day”. Trust me, I want no part of what I saw today. I played some basketball in school but once I got into the corporate world exercise like a lot of things took a back seat. Today I got scared straight let me tell you. I haven’t been able to eat meat for 2 days now. I’m scared to death of meat in general after seeing what I saw. My dad had to go through so much over the last few days I am so motivated to get healthy. If one of your favorite foods is ice cream and hamburgers like mine was, go to a hospital cardiac unit and see how good that hamburger and ice cream sounds after sitting in the lobby. I’m seriously contemplating going vegetarian, but want to talk to a dietitian as soon as I can to make sure I do things correctly. My dad is doing well, he had one heck of a day today. The anxiety of the last 5 days has caused a big strain on all of us, but nothing like it has for my dad. I could just feel the stress all over my body. My breathing was different, I got headaches, my back and shoulders were tight. I seem to carry other people’s stress and I could just feel the stress of the family all over me. I saw my dad three times today and like most dads, mine is like Superman to me. I really haven’t ever seen my dad down for very long, ever. Today he was strong as always and determined as ever but man did it shake me to my core about eating right and taking better care of myself. If you aren’t taking care of yourself, spend 5 minutes with me and I’ll try my best to convince you to change course. Run, jog, walk, hike, bike, get active and eat well.